The NSA must go, or America is gone. All psychopathic modality organizations/doctrines attract actual psychopaths like flies to honey. The potential power inherent in the NSA’s mission and capabilities is far too great for ordinary human beings to control — human nature is too corrupt. Psychopaths would take it even further to world enslavement. Psychopaths would be delighted to farm the masses of humanity. No one should ever think they wouldn’t. Factory farming of animals is psychopathic, a psychopathic NSA would seek to factory farm humans. 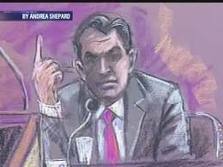 Perhaps we now know the cause of so many inexplicable judicial rulings, jury verdicts (e.g., Aafia Siddiqui, Governor Don Siegelman, the Newburgh Four (https://pathwhisperer.wordpress.com/2010/10/22/psychopath-earns-his-keep-shahed-hussain-cons-jury-as-well-as-newburgh-mugs/), Lynne Stewart, etc. ), U.S. Attorneys’ success rates, and legislative votes — NSA blackmail. The NSA renders almost all civil institutions suspect. A capability of power will always be translated into real power, that’s human nature and, even more, psychopathic nature. Function always follows form, ALWAYS. I had been wondering if somehow they had been packing the juries with psychopaths — that would be a junior partner to NSA blackmail of key individuals (including jury members (anyone who thinks they are too small for the NSA’s attention is foolish)) in bending verdicts. One Achilles heel, is that while psychopaths, individuals with ‘authoritarian personality disorder’ and worms-who-side-with-power are all natural allies, the alliance would fall apart if the latter two became aware of the presence of actual psychopaths. The last thing they would want would to be associated with ‘psychos’. Something to keep in mind. If interested, here are my other ‘antfarm world’ posts: https://pathwhisperer.wordpress.com/tag/antfarm-world/.